Vancouver Lawn Tennis Club hosted their 32nd Masters Tournament April 3-12, with 351 players competing in 33 categories. This year's event introduced four new categories - Men's and Women's 30, both singles and doubles. 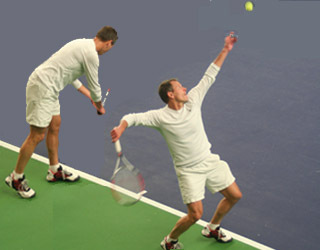 Photo 1(left): Lubomir Chobot, the winner of last year's Men's 75 Singles, passed away on January 19, 2009 from cancer. He was a West Vancouver Club member who represented Canada in senior tennis numerous times on travel teams. Lubo will be dearly missed by the tennis community. Photo 2: Thanks to the sponsors, Floyd Hill of Odlum Brown, left, and Jeff Carrie of BMO Nesbitt Burns. Floyd reached the semis of the Men's 65 Singles where he lost to the top seed John Hylton-Foster in a close match 6-4, 6-7, 7-6. Floyd is the chair of the Odlum Brown Vancouver Open, an ATP Challenger event. Photo 3: Julie Reynolds, left, and Leah MacFarlane. Julie, the second seed, reached the final of the Women's 45 Singles, and Leah advanced to quarters of the Women's 40 Singles. Leah and Dave Pentland were the two lucky winners of free tickets to the Vancouver Open. Photo 4: Hold it! Trevor Richards failed to stop Joachim Nierfeld in the final of Men's 40 Singles. Trevor lost 3-6, 4-6. Photo 5: Top seed Jean Martin lost to Jandi Fraser in the semis of the Women's 60 Singles 4-6, 7-5, 7-5. Jandi, the un-seeded lefty, later went on to beat Patricia McLachlan, last year's winner, 6-3, 6-1 in the final to capture the title. Photo 6: At the Players Reception, from let to right, Lance Stiles, Amir Somji and Bill Nordmark. Lance beat John Hylton-Foster to win the Men's 65 singles title. Amir and Bill were doubles partners in the Men's 65 Doubles. Bill Nordmark, president of the West Vancouver Tennis Club, is inviting you all to play at the Senior Open scheduled in August. Photo 8: Russ Hartley, who missed the event last year because of knee surgery, beat Paul Shellard 6-2, 6-4 to win the Men's 50 singles. Ed Bakker, last year's winner, did not play this year. Photo 9: "It's time!" Referee Joel Brobecker is keeping time in the final of the Men's 30 Singles. Jerry Turek beat Stan Puskas 6-1, 6-0 to capture the title. Photo 10: Tennis forever! Friends forever! Sheila Kerin of West Vancouver, left, and Margot Thomson of North Vancouver playing in the Women's 75 Singles. Stefano Walker this year teamed up with his brother Fabio to beat his last year's partner J.J. Mahoney, playing with Robert Exell, 6-4, 6-3 to win the Men's 35 Doubles. Max Brown did not show up to play this year, but his last year's doubles partner Julien Heine was on the courts and beat Collin Koo to win the Men's 35 Singles.